You expand your main Set (Urban or Outdoors) with a 3'x3' "Outskirts" set. This is an 9-tile set, which can form a 3' x 3' board. It's introduced with the idea of extending a 3'x3' Urban Set, to form bigger, more diverse gaming areas. You have to pre-order a Base Set before adding any more tiles and/or base sets in your order. Outskirt Sets can be joined with your selected Urban Sets and act as outer suburbs of your settlement. These Sets combine the "Transition Tiles" along with existing tile designs from the Outdoors Pedion Modular Battlefields themes. They are NOT new Urban Battlefield themes, their purpose is to complement urban sets. The 3'x3' Urban Outskirts Extension Set consists of 9 Tiles. Six (6) of them are in one of the original Pedion Themes, and their types will be 2x "Road", 1x Plain Ground, 1x "Forest", 1x "Broken Ground" and 1x "Medium Hill". The other 3 are transition tiles, joining the aforementioned Pedion Theme with the Urban Theme of your Set, and they will be 1x "X" intersection, 1x "T" intersection and 1x "Straight Road" transition tile types. The original Pedion Theme can be any one of the 5 available to Pedion clients and backers: Green Spring, Desert, Winter, "Red Planet", "Grey Wastes". 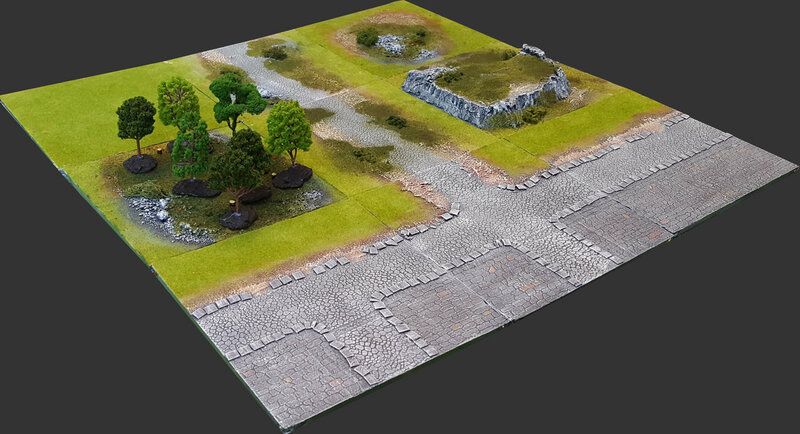 The 3x3 Outskirts can complement your 2'x2' or 3'x3' Urban Set to form larger gaming areas!